Here's a recipe for a gorgeous fiber- and antioxidants-packed blueberry smoothie. It makes a perfect meal replacement or can be served as a healthy dessert. 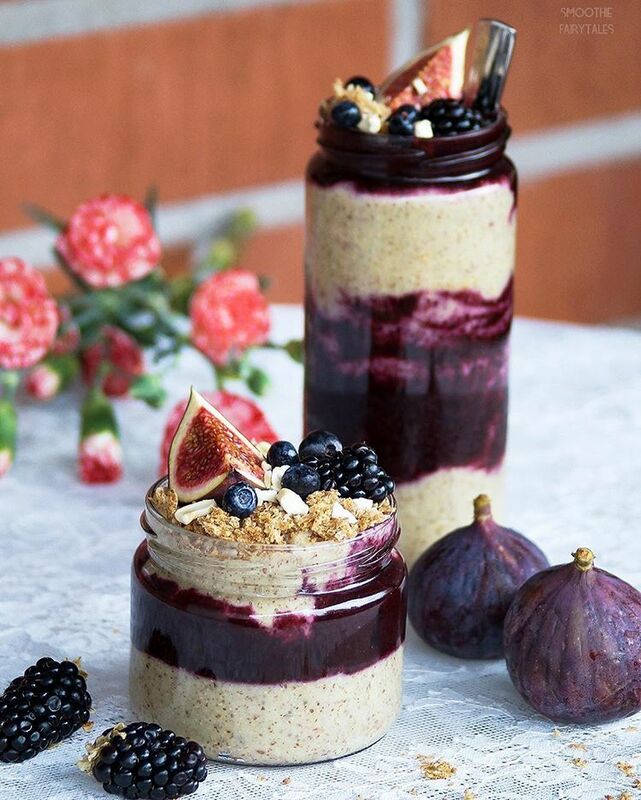 To prepare the blueberry nice-cream, simply add the blueberries and the sweetener (optional) into your blender jar, and process until nice and smooth. Wash your blender jar in order to create clean and distinct layers. Start with the yogurt and pour it into the blender jar. Peel the apple and the pear, or wash them very throughly, roughly chop and also put into the blender. Peel the banana and break it into chunks and add to other ingredients in the blender. Lastly, add the chia seeds and the flax seeds. Pour the beige layer and then alternate it with the blueberry nice-cream. Repeat once again if your serving glass or a jar allows it. Sprinkle with granola, seeds, or nuts of your choice. Decorate with fresh fruits. Serve this smoothie immediately. If you want to eat it later, the smoothie can be kept in the fridge for up to 24 hours.